The Warrior Dash was kind of the race that started it all. My wife suggested that we train for it. My initial reaction was “no way!” but after some thought, I figured it would be nice to h ave a reason to get more active. I started to train using the Active Couch to 5K app for the iPhone, and I enjoyed it. It was surprising how fast someone who wasn’t in great shape could pull it together. I went from not being able to run for full minute to running a full mile in just a few weeks. As part of the training, we ran a 5K race as practice, and it went well. So, the Warrior Dash. It was a fun race, but I was disappointed. It was 5K, for sure. However, I just didn’t find it that challenging. There were some neat obstacles, and some gross muddy obstacles. The muddy obstacles, unfortunately, existed for no other reason than to make you muddy. For the most part, there wasn’t anything challenging about them. The obstacle that took the most time (more than five minutes) was a muddy trench. It took so long not because it was so difficult, but because there were so many people backed up in front of it. Honestly, it was more annoying than anything else. Running in the woods was fun, and made me look forward to similar events (I’m considering a 10k trail run in the near future). And don’t get me wrong, it was worth doing, we’ll do it again – the atmosphere was fun, and it was a good time. It just wasn’t a physical challenge for me. In fact, I wasn’t sore the next day, even though I didn’t do any upper body training at all. Still, I recommend it. And, if you were out of shape like I was, it was a fun reason to turn things around. The C25K program was extremely successful for me. It gave me endurance and more strength for my runs, and made me excited about doing better. If you aren’t excited to improve, you’re just not going to improve. 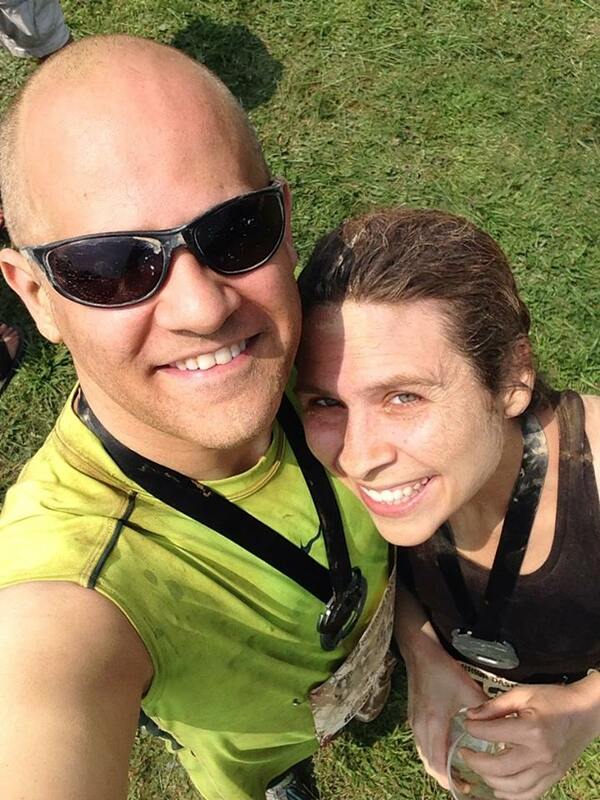 As I was starting the C25K program, my wife suggested that we take on the Warrior Dash in a few months. Of course, I thought this was a horrible idea. At least, at first. After some thought, I thought it might be nice to have a reason to train. 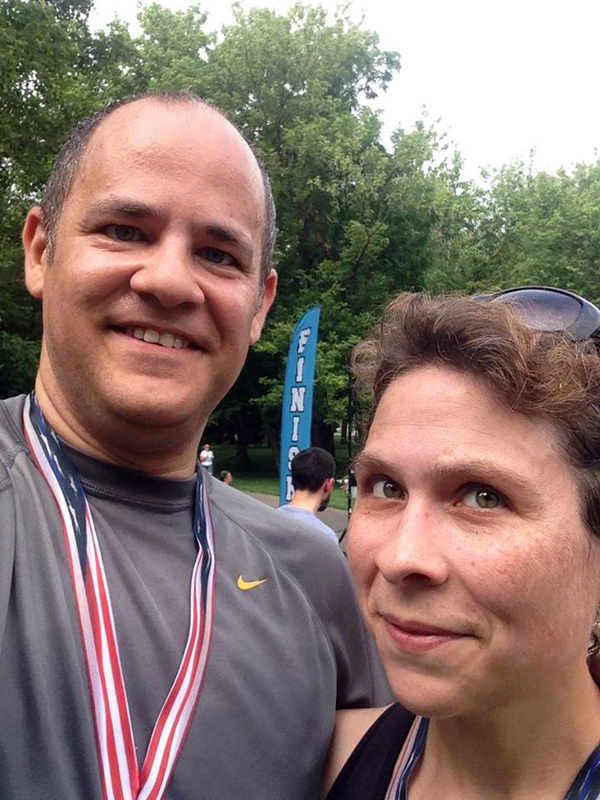 Additionally, I w anted to do a 5K race first – a practice, I guess. 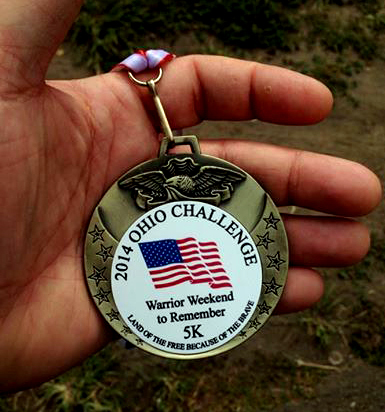 We settled on the Ohio Challenge Wounded Warrior Weekend to Remember 5K Run/Walk. 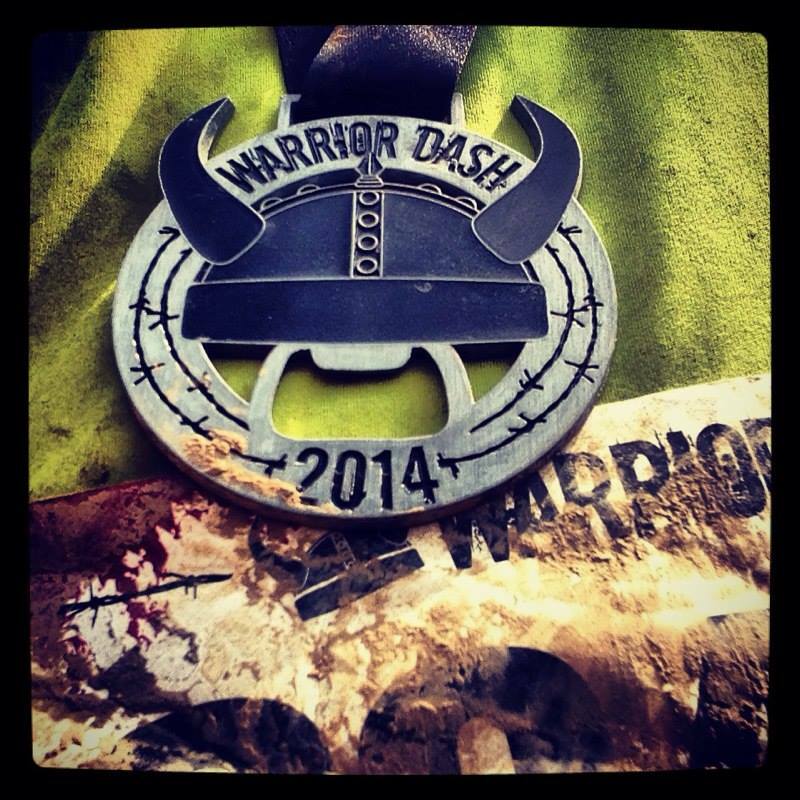 It was about a month before the Warrior Dash, so it seems to me like it would be good practice. It was, and was definitely worth it. It was a lot of fun. I wasn’t quite hitting 5K in my runs yet. Close, but still a half mile or more off most of the time. The race itself was my first complete 5K. It was an eye opener. I started off too fast, I didn’t pace myself at all, and I used up everything I had in the first 2.75 miles. The remainder of the race I had almost nothing left. My time was decent (30:17 , not bad for a first race) but I crossed the finish on autopilot. Still, I learned a few good lessons about fueling myself and pacing myself. 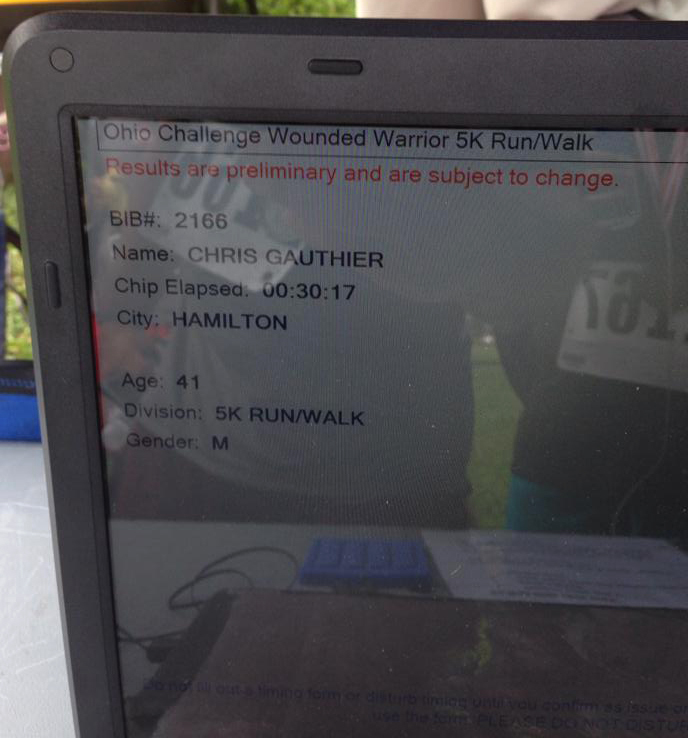 It was a great experience, and helped me to run the Warrior Dash much more efficiently. I’m starting this blog to chronicle my running progress. I probably won’t even advertise it, but Google will find it. Maybe it will be helpful to others. I started running in July. I’ve been dieting and trying to lose weight (I’m down about 40 pounds from last fall), and wanted to step up my physical fitness. I know a lot of runners, and many recommended Couch To 5K programs. I used the program from Active.com, and it worked well for me. It starts you off slowly, running for a minute, walking for two. Over the course of nine weeks, it slowly increases your run time and decreases your walk time, until you’re running for 30 minutes. I found a lot of success with the program. I discovered a few things, though. There were two workouts that were so difficult that I needed to stop before I finished – the first one, and one four weeks in, when I had to run five minutes straight. During the first exercise, I was just running too fast. In my head, I figured it was easily, I’d sail through, I’d have no problem running a minute. Nope. The second time, was the first exercise of week four. Thing is, I had only been doing the program for two weeks. I was increasing my weekly mileage too fast, and not letting my body repair itself. I made a mess of my feet both times, and had to take breaks to recovery. Rest days are incredibly important. Your body uses the days of rest to heal. When you run, you damage and tear your muscles. That’s actually the point of the the workouts. Then, when you rest, your body repairs that muscle, and makes them stronger. That’s the point of the rest day. It’s absolutely necessary in order to increase strength and endurance. I didn’t get this at first. In fact, a couple of months in and I’m still having trouble getting this through my head. I don’t rest enough. I’m working on it. Some weeks I run every single day. Some days, I run more than once. This week, I’m doing two long runs (though, my long runs aren’t that long yet). Probably more than I should do in a week, but I’m also forcing myself two days of rest or crosstraining. Crosstraining is an important way to strengthen your body in ways that can benefit your running, or other activities. You can work on your core (think burpees, squats, lunges, etc), bicycle, swim, or work on your upper body with weights. This is another thing I don’t do enough, but I made a point to bike or walk once in a while while I was doing the C25K program. That’s basically the gist of the C25K program. I found it to be fun. I was really surprised at how much I was able to do after such a short time. It’s a great program to get started with, I recommend it to anyone who wants to start running, but might be worried about their abilities. You can use the advice you find here, if you want. If I were you, I wouldn’t. Read some of the stuff I say, then look up the right way to do stuff.